My experience of moorland has largely been limited to my own wanderings around the South West of Scotland, and the vastness of Rannoch Moor, one of the places claimed to be one of the last true wild places. 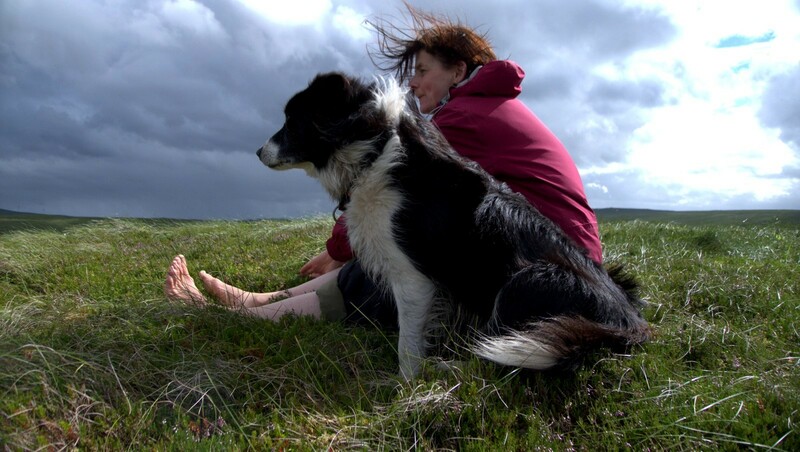 The chance then to walk accompanied over the Lewis Peatland with artist Anne Campbell and spend a night in the heart of the island really appealed to my curiosity. Before I had even begun my journey I had enjoyed listening to the experiences of Deirdre Nelson whose own trip across the moor had been a quietly revelatory experience, shared with Anne, her sister, and Murray Robertson in fine Summer weather. 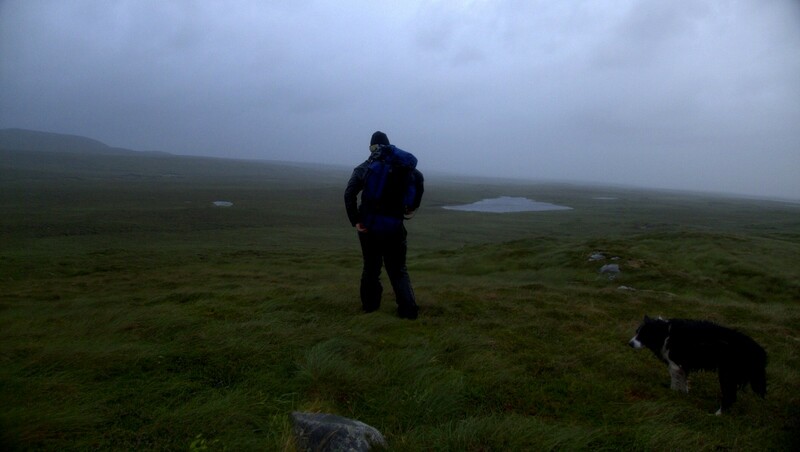 Less than a week later, conditions on Lewis had grown increasingly cloudier, and as weather and storm warnings became the main topic of conversation, we made the decision to cross the moor to her family shieling, located on the slopes of Beinn a’ Chanaich Mhoir and by the waters of Loch nan Leac. Looking at an OS map, our final destination seemed only five or six miles away, however with the ground between us and the Shieling wet and marshy, every step seemed like it would be a torturous effort. With a heavy Bergen laden with cameras and camping equipment, the prospect of terrible weather and harsh terrain, it looked like it was be shaping up to be a challenge. Leaving the car at the end of the track, Anne, Bran the ever enthusiastic border-collie and myself made our way along the waterlogged peat road towards the moor. Our path would follow along the course of the Abhainn Arnol, a shallow river which runs the length of Glen Bragar. To our right Beinn Choinnich (the Hill of Kenneth) loomed over the landscape, while in the distance the distinctive pyramid form of Stacaiseal filled my horizon. Passing men loading dry peat into the back of tractors, my eye caught something small, boxlike and metallic in the edge of the riverbank. On closer inspection Anne informed me that it was a trap for mink, which along with hedgehogs was introduced to the island in the 1950s and 60s, and caused widespread damage to the birds of the moorland. It is only now that many of them are beginning to return in number. The peatland terrain requires constant attention. Our next pause on the moor was signalled by an excited bark by Bran, who started digging furiously into the peat. Anne explained that we had arrived at her own peat field, and that Bran was simply imitating the actions of Anne and her sister who still dig peat for their homes. 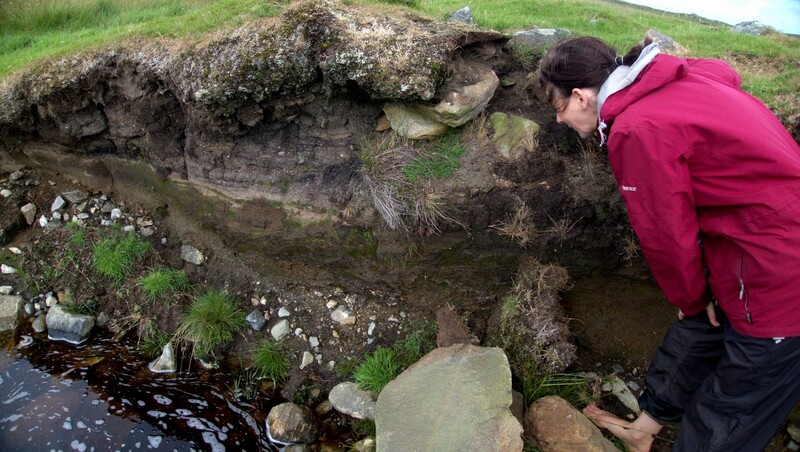 It was on this site that Anne, whilst digging a peat bank found a wooden bowl, the earth giving it up after holding on to it for over a millennia. It is one of the undoubted many thousand objects that the moor has held onto, waiting for an archaeologist to uncover and tell of the story of those who once lived here. Whatever lies beneath the many levels of sphagnum moss is no doubt well preserved from the elements, from a time when the island was warmer, and more populated. 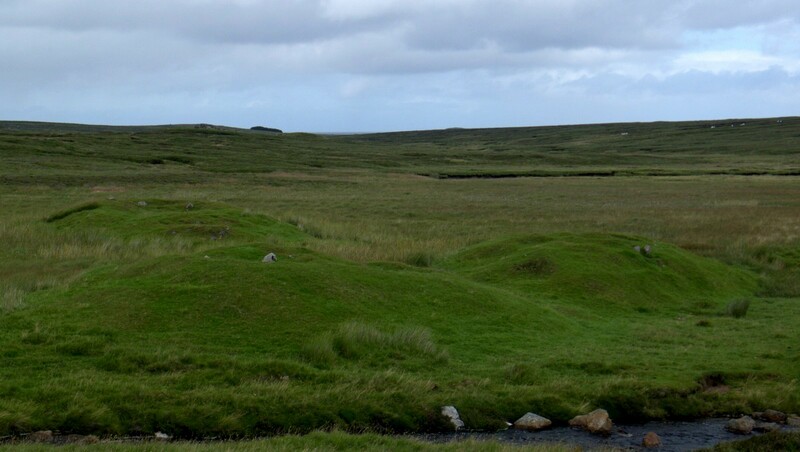 It is unfortunate that unlike the well excavated and fascinating Ceide Fields in the North West of the Republic of Ireland, little archaeological research has gone into the North of Lewis, an area obviously rich in potential finds. It was this frustration which led Anne to return to University to study archaeology, and as part of her Masters dissertation she walked the land and recorded finds. What she uncovered added hugely to existing knowledge, yet there is still more work to be done. The mounds of tulachan, early dwellings. On a bend in the river Anne shows me the remains of Tulachan, five grass covered mounds which were once part of a settlement. Slowly as the river has changed course it has begun to erode the site, with one of the mounds collapsed, spilling its contents into the fast flowing water. Anne and I explore what is left, find some charred wood, and continue on our way, fording the brown, peat coloured water. Examining the Tulachan for finds. 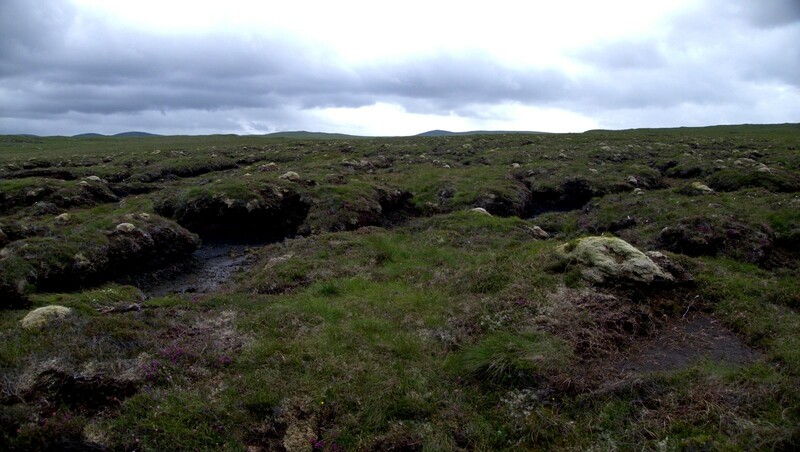 Once across, the landscape stretches out to the far hills, with every step across the peat made carefully. I am reminded by Anne that what appears as solid ground is in reality a treacherous terrain. 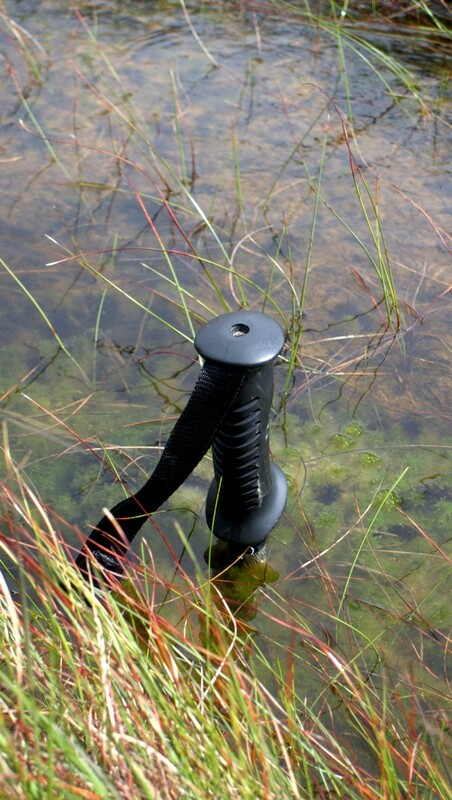 At one point my walking pole slides effortlessly down into the bog, disappearing almost completely. The fear of a misplaced step into earth which will swallow me whole helps focus the mind, and I follow Anne’s barefoot steps intently. Other dangers include hidden river courses, holes, and being exposed to the elements. 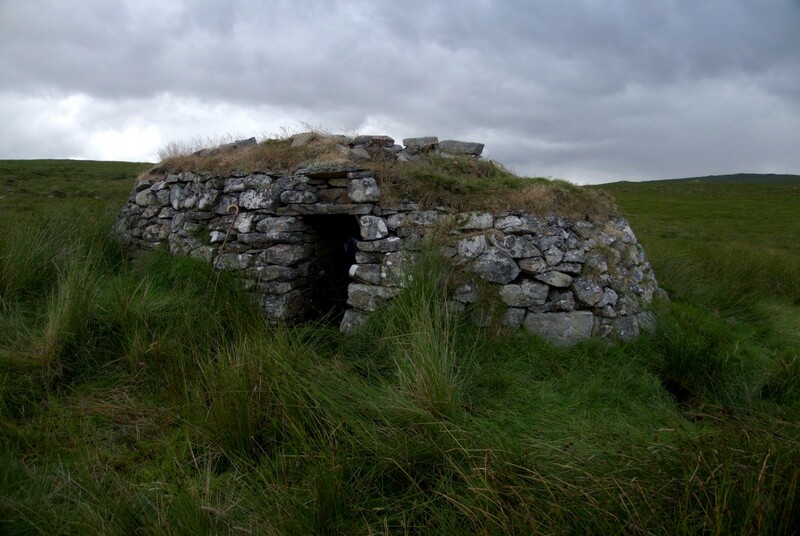 We had been walking and exploring now for the best part of an hour, but with the weather now closing in, and the wind and rain starting to move across the open moor, we took shelter and eat in the ruins of a shieling. With no roof, we sheltered against the high walls and waited for the rain to pass. Anne commented that this type of weather is known as a ‘Red Wind’ in Gaelic. 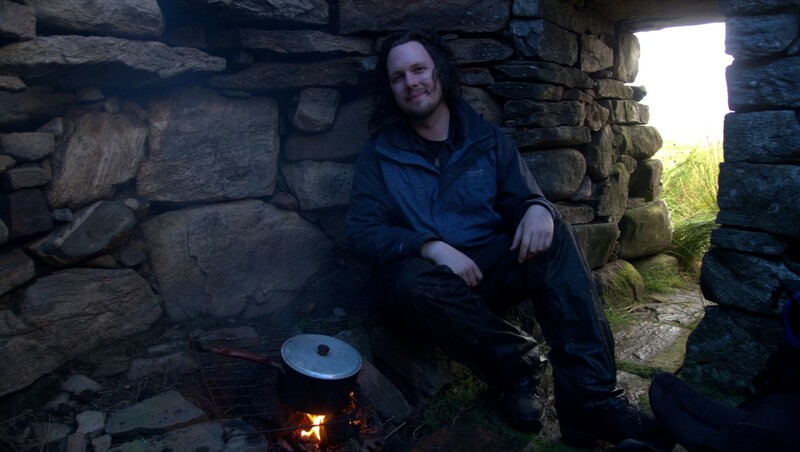 As we sat, I contended myself by exploring the walls, finding rusted pots and an old kettle amongst the long grass. With a break in the rain we pushed on, at times following the footprints left by Deirdre and Anne from the week before, perfectly preserved in the peat. Passing a picturesque loch ringed by sundews, we stop by the shieling once used by Anne’s father, before making our way onto the final hurdle, going over the top of Beinn Thulagabhal. Exhausted we sit on the grassy top, and as the wind and clouds move quickly over the scene, I see the shieling for the first time. At this stage I can’t wait to get there and find some shelter from the elements. The Shieling, where we hoped to spend the night. It is not long before we have skirted the edges of Loch nan Leac and are sitting inside the shieling, the wind now howling relentlessly around us. 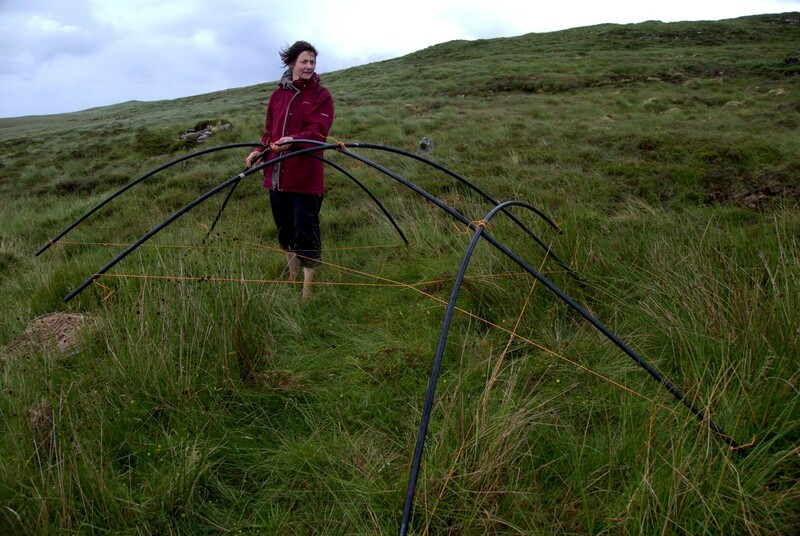 Having come this far we decide to erect an improvised roof over the shieling, something Anne has done many times before. Using nothing but plastic piping it is not long before she has created a rigid tent like frame which we move into position on the top of the shieling. Standing a few metres above the ground, we teeter on the edge of the building as the wind blows us around, trying to anchor the frame using rocks and stones. After several failed efforts we finally secure it, something which proves much easier than attaching the roof covering. Catching the canvas roof like a sail, the material whips around violently as we try to anchor it to the structure below. We both dance around the edge trying to keep it down, the wind billowing up from the open doors of the shieling. After a long struggle, and collecting additional rocks, it is finally in place, threatening to blow off any time. The rain is now driving hard, and the wind is getting stronger. 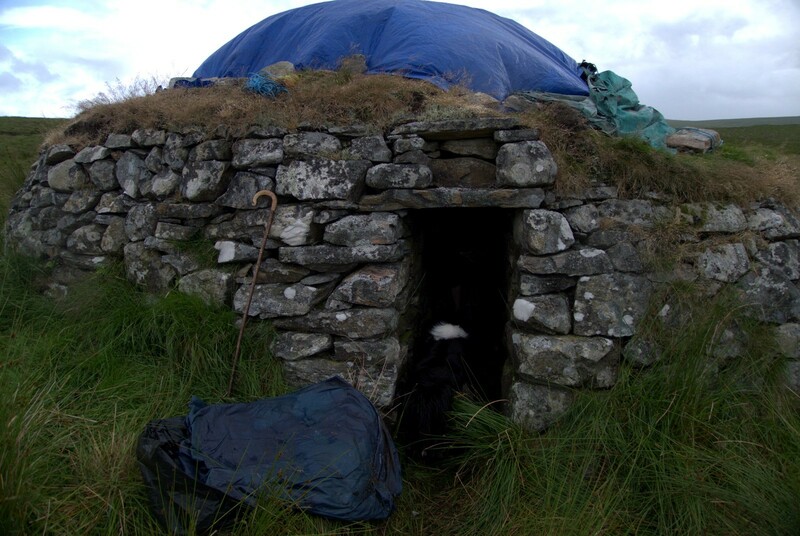 Bran refuses to come inside the shieling, scared due to the horrendous noise made by the sheets, which flap and crack. It sounds as if a freight train is passing over ahead, as we shout our conversation with only a few feet between us. The roof is finally on, but for how long? Bran guards the door. A brief respite from the wind and rain. I’m soaked but happy. 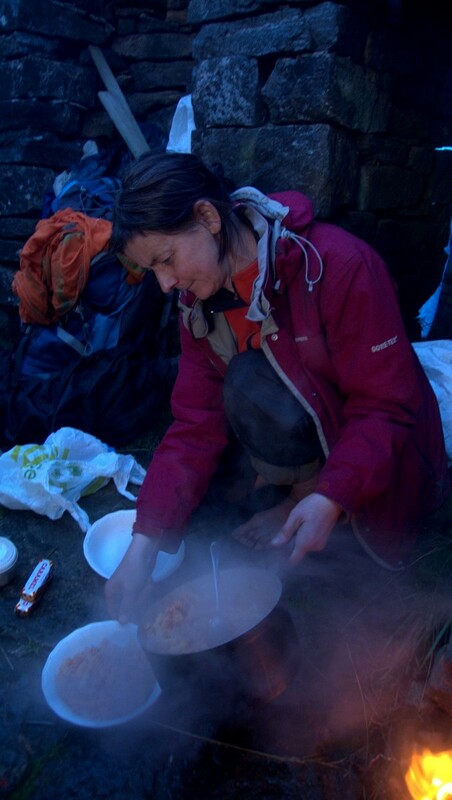 Amidst the chaos, Anne lights a fire using dried peat, boiling water that she has collected from the loch. Two cups of warm Darjeeling are then enjoyed, and we reach the decision that in this weather staying out on the moor is not advisable. 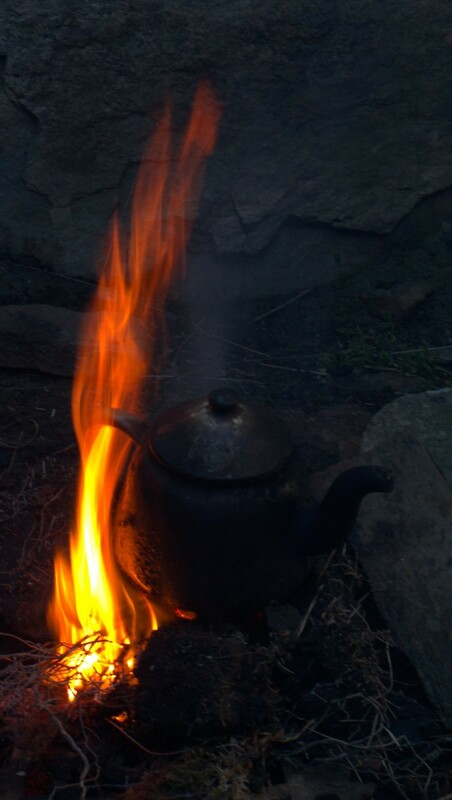 Warm smoke fills the shieling. As a pot of pasta cooks over the peat fire which has now filled the shieling with smoke, I explore the walls again, noticing the carvings on the wall. The oldest from 1821 marks the date that the Shieling was re-built from an earlier structure, and another from 1921 commemorates this date. Anne is hopeful that she too may add 2021 to the walls of the Shieling, which are otherwise bare, save for a carving of a deer and the initials of those who have come before, including the much loved Gaelic poet Peter Campbell. I enjoy the time I have in the Shieling, feel I am part of the landscape, and appreciate the view out onto the moor, while staying warm. Time seems to have stopped. With our meal over, we know that there are only a few hours of light left on the moor, and that if we do not leave soon we will be forced to walk across the land in darkness. This prospect is not one that we relish, and is potentially dangerous as well as foolhardy. We are however both exhausted from our exertions, but pack the materials away and make our long journey back. In our tired state we still manage to make good time over the landscape which is getting increasingly grey, wet and dark. In my tiredness I fall into a hidden hollow, my body sinking into a hidden river up to my waist. It is unexpected, and forces me to focus. I recover quickly and ford a succession of rivers, and we make our way towards the coastline and the village of Bragar beyond. As we finally exit the moor I am forced to use a torch to see the path in front of me, but am thankful that I had Anne as a guide over the land. For days I’d be reminded of my journey, as the smell of peat smoke would rise off of all my belongings, but the memory of experiencing the moor in all weathers and conditions will last with me much longer. This entry was tagged Anne Campbell, artist, Lewis, moor, peatland, sheiling, shieling. Bookmark the permalink. I love this blog Anne, you are so close to nature and as a reader, your descriptive words and recollection of sounds, make me feel as though I am there also…..